It was the “perfect ending” to what has been an outstanding year for The Encephalitis Society. Around 150 people donned masks, many of which were home-made, for a Masquerade Party in London to celebrate our 21st anniversary. The revelry was a fitting finale to a busy year for the charity, a year which has seen us spread the message about encephalitis and The Society further and wider than ever before. It was a wonderful end to what has been a landmark 12 months for us. We have managed to spread awareness about encephalitis to more people than ever before. We reached 13 million people on World Encephalitis Day and our 21st anniversary roadshow exceeded all our expectations. Visiting 21 UK cities in 21 days was very ambitious for a small charity such as ours, but the response from the public at every city we visited was amazing. 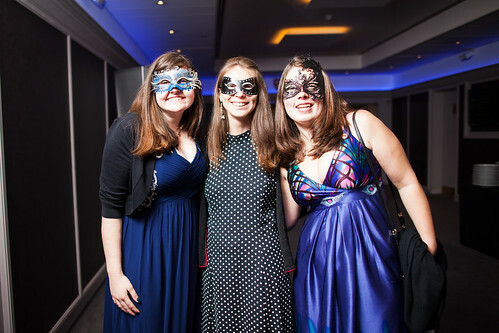 Glaziers Hall, which lies a stone’s throw from London Bridge, was the setting for the Masquerade Party on Saturday, November 7. Speeches from Ava and Prof. Tom Solomon welcomed the crowds to the venue before a slap-up meal and some sleight of hand from Norvil the Magician. Then came the serious part of the night – the awards. The Exceptional Service Awards saw a number of people earn recognition, including Leo Rytina, Sandra Piercy, Joanne Beck and Helen Coyle, as well as the staff team on the Chavasse Ward at The Walton Centre, who were praised for their care. Fundraising awards were also handed out to Annie McWilliams (Innovative Fundraiser), Harry Shaddick and Jack Robinson (Junior Fundraiser), James Pratt (LifeLong Fundraiser), Leisa Chadwick and Friends (Community Fundraiser) Stephen Weatherhead and Friends (Challenge Fundraiser), and The Baughan Family (Family Fundraiser). It was also a special evening for Ambassador Mathew Bose who was honoured for his dedication to The Society. Mathew first became involved with us 10 years ago after a close friend of his was affected by the condition. And as we all know, he has been a stalwart supporter and championed awareness of encephalitis and the work of The Society ever since. The guest list also included supporters Tonia Buxton, Rebecca Adlington, Simon Hattenstone, Aliki Chrysochou and Susannah Cahalan. We turned to York Racecourse for our 2016 Annual Members' Meeting which celebrated the theme, The Year of the Narrative. Local dignitaries joined us to celebrate the 90th birthday or Her Majesty The Queen at The Talbot Hotel on Thursday, April 21.